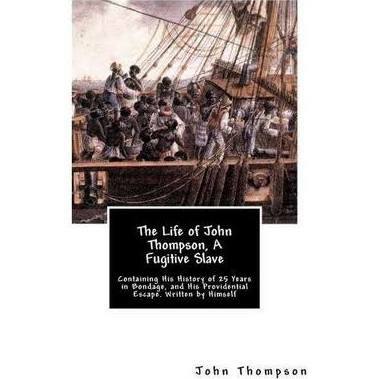 John Thompson, in the above named autobiography, spoke about the horrors of the slave system in the South before the War of Northern Aggression, or the Civil War. He speaks about the beatings for no apparent cause and all the abuses of the slaves, the slaves having no protection under the law from such troubles. Then, he began to make relations between slavery and the following sanctions. He describes a plantation owner who tried to choke a slave and ended up dying from a heart attack while doing so, thus showing the relationship between the slaves and the sanctions given to those who held them as slaves and treated them cruelly. Another cruel plantation owner tried to go into a burning barn and save part of his tobacco crop, and ended up having part of the building collapse on him while trying to get out. He also gave the example of a good owner who treated the slaves well, and he had very good crops, along with all of his neighboring plantation owners who did the same. So, John Thompson believed in the intervention of God in Man’s affairs; not only did God notice, God took and takes action against those who are cruel. He also made clear to the readers of the connection between what is done and the recompense for it. Cruelty was rewarded with appropriate sanctions, and good was rewarded with the appropriate positive sanctions. ← Should the Government Provide Public Goods?